Yes, it took me a while to get out in it but, as you can imagine my gear closet is a little ‘large’ so I had to sneak this one past my wife to get it added to the gear menu. Fortunately, she is now completely a fan. We took the Big Agnes Big House 4 Tent car camping up to Larabee State Park on the North Washington Coast near Bellingham with our parents group (5 couples and 5, 18 month old toddlers). I set up the tent and the optional vestibule so we could check everything out. About 30 minutes after setting everything up….the skies opened up and it just POURED for about 3 hours. This wasn’t the typical WA State drizzle, this was more like a Hawaiian style ‘dump’. There aren’t many tents that can handle that amount of water coming down and there are even fewer with vestibules of this size available. The vestibule rapidly became our family ‘mud room’ and while my then pregnant wife and 18 month old son stayed dry inside, I ran around and helped the other couples keep their tents dry during the onslaught. Coolers, stoves, tools (and sometimes people) all took refuge under the vestibule for a majority of the evening. 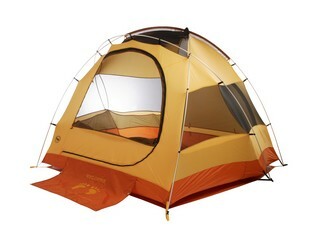 I have been a fan of Big Agnes for quite some time and we really love all of their products. However there are few products that inspire me to actually call up the owner of a company and personally tell him how much I love them. This was one of those rare cases where I needed to really let them know how awesome the Big House 4 tent really is. While we recently replaced our Big House 4 Tent with the larger, Big House 6 (we now have a 10 mo old and a 2 1/2 year old), you can be assured that this will be a staple piece of ‘gear closet’ for a very long time. There simply isn’t a better tent+vestibule combination out on the market and I wouldn’t think of putting my family in anything else. « Save the Date! Big Warehouse Sale!